​Ballot deadlock: Who will rule Britannia after election? As millions of people across the United Kingdom begin casting their votes in the nation’s most unpredictable general election in 40 years, RT explores the possible forms a new government might take. On Wednesday May 12, 2010, newly-elected Prime Minister David Cameron stood alongside Liberal Democrat leader Nick Clegg to announce the beginning of a “historic” coalition. Over the past five years, the UK has been ruled by its first coalition government since the Second World War. With opinion polls indicating no single party will gain an outright majority in this election, RT asks: what will the next UK government look like? RT CCHQPress "RT Conservatives: Nicola Sturgeon and the SNP propping up Ed Miliband? That means more taxes, more b… pic.twitter.com/0x97nnrao5"
The Scottish National Party (SNP) is set to win 50 of Scotland’s 59 seats by the most conservative opinion poll, meaning it will become Britain’s third largest party overnight, largely at the expense of the Labour Party. While Labour leader Ed Miliband has ruled out a coalition with the SNP, a power-sharing agreement between them could see the two center-left parties form a government with a clear majority in Parliament. 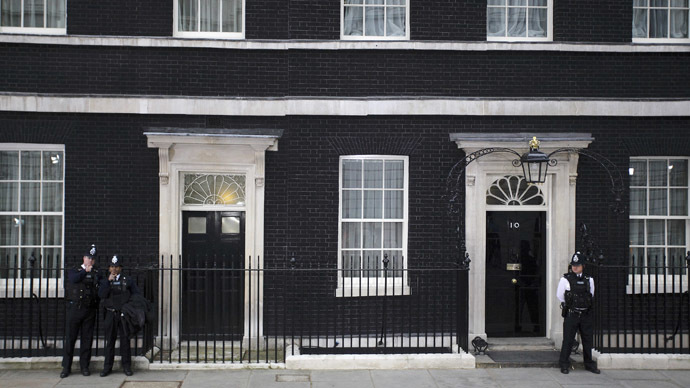 A second Con-Lib Dem government may be the dark horse among the possible coalition scenarios. While the Tories and Lib Dems have been publicly attacking each other since campaigning began, figures inside the Conservative Party suggest a second coalition could be on the cards. A Tory source told the Daily Mail that another pact may also involve “a bit of DUP” – Northern Ireland’s center-right Democratic Unionist Party. Dubbed a “rainbow coalition,” this scenario would see Labour enter into some kind of agreement with the UK’s other main center-left parties. The pact could be an official coalition, but would more likely see Labour supported by SNP, Plaid Cymru and the Greens on a vote by vote basis. Leaders of the SNP, Plaid Cymru and Greens signaled their intention to form an anti-austerity coalition last December. If they formed a pact with Labour, they could use their influence to soften further budget cuts. According to Polling Observatory, a group of academics who provide commentary on opinion poll data, a Lib-Lab coalition with informal support from the SNP could hold 355 seats, enough to survive a vote of confidence. The idea of a Lib-Lab coalition has been largely ignored by the media during the election campaign, but could it work? Given both parties emphasize reducing the deficit “fairly,” a Lib-Lab government may be more plausible than a Conservative-Lib Dem repeat. All three parties are center-right, back further austerity cuts and are prone to Euroskeptic views. Supporters of the Conservatives, UKIP and DUP tend to be morally conservative also, with UKIP and DUP in particular known for their conservative stance on women’s rights. UKIP leader Nigel Farage has said he would work with the Tories to stop a Labour-SNP coalition in return for an earlier referendum on Britain’s membership of the EU. However senior Tory figures have ruled out a deal with UKIP. There has been growing talk of minority governments in recent days, a situation where a party governs without holding a majority in the Commons. The UK had several minority governments in the 20th century, including the Asquith government of 1910-1915 and the Labour governments of 1924 and 1929-1931. Some predict if the Conservatives win the most seats, Cameron will claim the Tories have a “legitimate” right to power as a minority government. Meanwhile, Miliband had drawn up plans for seeking union support in the event Labour goes it alone, according to inside sources. Known as a ‘grand coalition’, this scenario is the least likely of the bunch. While rare in the UK, power-sharing agreements involving major parties are more common in Germany. Angela Merkel has led three grand coalitions since becoming chancellor in 2005. The last Labour-Tory coalition occurred in 1931 and lasted for four years.